Take a Look at the Variety in Contact Lenses! Contacts are the perfect correction solution for those who do not want to wear eyeglasses and or undergo corrective surgery. Millions of people wear contacts, especially those who lead active lifestyles and want crisp, clear vision without having to keep a pair of glasses on their face. If you're interested in wearing contacts, the first step is to have a contact lens examination by an eye doctor. A contact lens exam is meant specifically to fit you with contacts. During a contact lens examination the eye care professional will determine if your eyes are healthy enough to wear contacts. There are two major groups of contacts: soft contacts and rigid gas permeable contacts. Soft contacts are extremely thin and comfortable to wear. They are made mostly of water, which is why they are soft. Soft contacts are divided into four basic categories: spherical contacts lenses, contacts for astigmatism, contacts for presbyopia, and colored contacts. Rigid gas permeable contact lenses are made of hard plastic that gives crisp, clear vision and corrects most vision problems. They are durable and last longer than soft contact lenses. Some contacts are meant for daily wear. Daily contacts are worn for one day and then discarded. 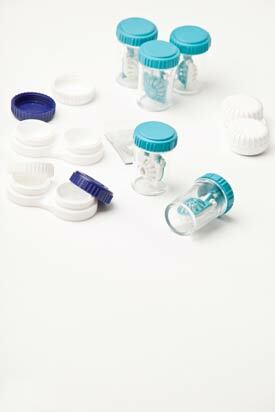 Other soft lenses and some RGP lenses are worn for a day and then removed, cleaned, and disinfected each night. Soft lenses are usually replaced on a regular basis. RGP lenses may last for years with regular care. Use quality lens care products and clean the lenses as often as possible to remove buildup of bacteria. Be aware that wearing contact lenses for a long period of time may cause blurry vision, pain, and redness due to a lack of oxygen passing through to the eye. Remember that contact lenses are medical devices: with proper care you will see better and will have peace of mind knowing your contacts are healthy and safe for your eyes.